This #1 New York Times Best-Selling title is now available in a Spanish language edition! 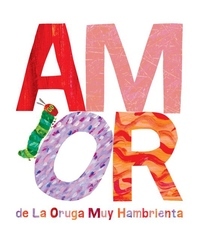 Celebrate love and ring in Valentine's Day with The Very Hungry Caterpillar in this adorable book, which is now available in Spanish! This charming, sweet title featuring The Very Hungry Caterpillar is the perfect gift for that special someone on Valentine's Day--or any day of the year. "You are the cherry on my cake; you make the sun shine brighter; you make my heart flutter." Using a range of images from the World of Eric Carle, and featuring The Very Hungry Caterpillar, this special gift book gives all the reasons why someone special makes the world a better and brighter place. Perfect for Valentine's Day presents, a must-have for fans of The Very Hungry Caterpillar, and an ideal gift for that special someone.